Many manufacturers have produced collectible porcelain dolls over the years. Some have notable value others less so. This is a guide about determining the value of Collectible Memories porcelain dolls. 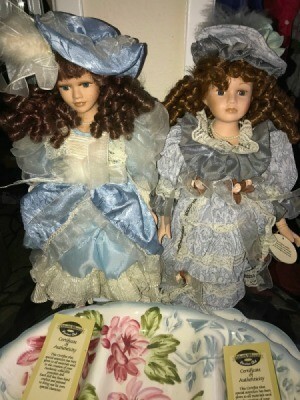 I have two porcelain dolls from Collectible Memories. Both appear to be somewhat vintage and have certificates of authenticity. They were designed by Norma. I cannot find information about them anywhere. If anyone has any information it would be greatly appreciated. 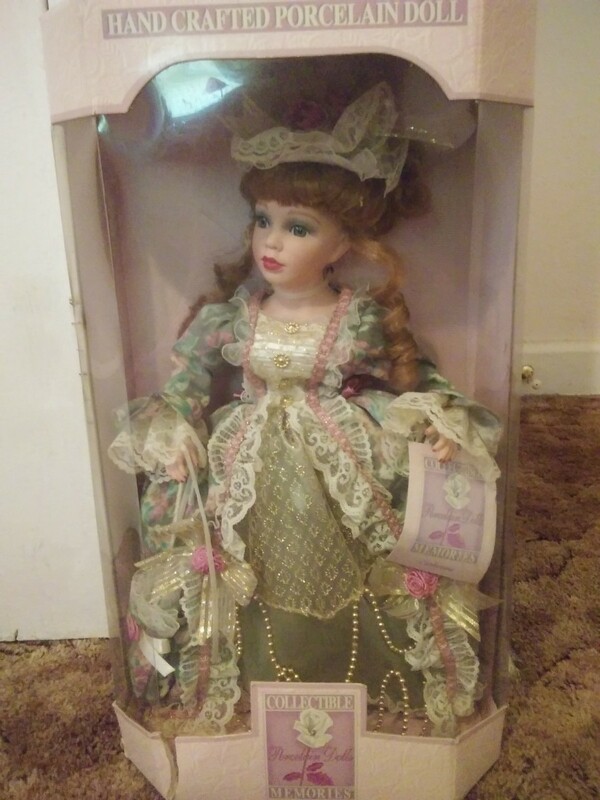 I saw the 30-inch doll for $74.25 on bonanza.com. 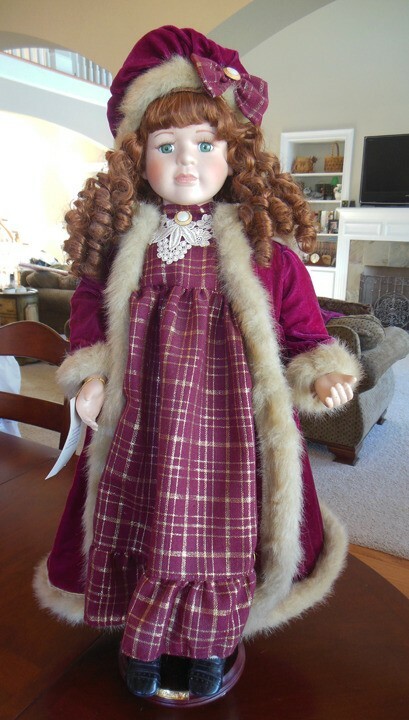 These dolls are lovely but this type of doll usually does not have a high resale value. The maker tends to mass produce them and this just makes them very "common". 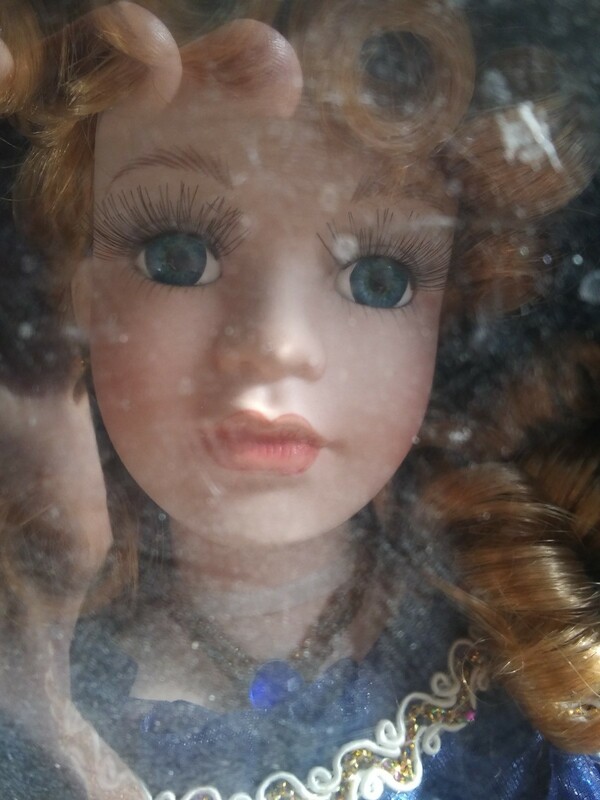 I would like to find the value of a Collectible Memories fine bisque porcelain doll. It is a limited collector's edition, Paula Beth. It has a hand crafted face, arms, and legs. She has hand tailored fabric-trimming, accessories, a rocking horse, plus a certificate of authenticity, and display stand included. 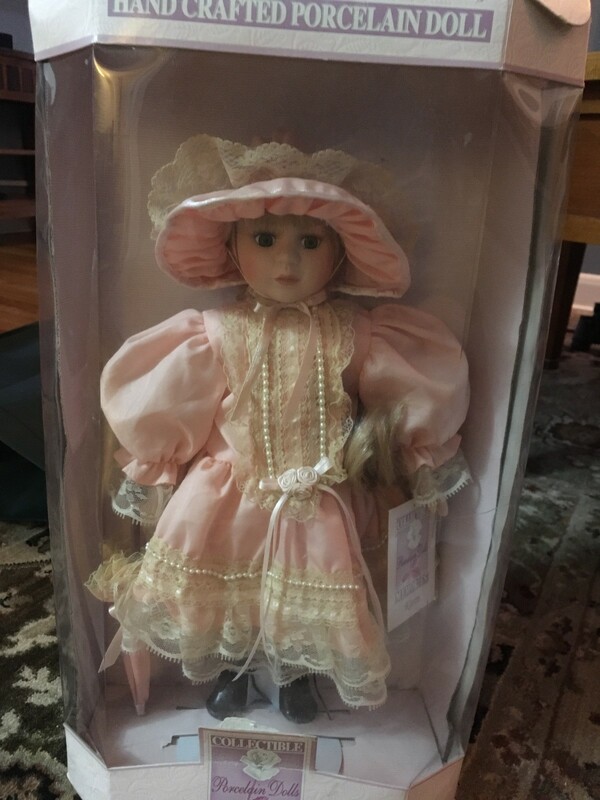 The doll is pretty old and I want to know its value in order to sell it. You will want to watch her to see if she sells and that will give you her exact value OR you can list yours for less and then a buyer would pick yours vs. this one. I feel bad she is not worth more. She is adorable! I ask this question because I cannot seem to find Reesa anywhere. I am wondering if anyone knows how much she is worth. I see the other folks for sale, but not her. Collectible Memories dolls are mass-produced and are usually not more than $25 used. I have a Collectible Memories porcelain doll. She is 28" tall. Her name is Arleen. I've attached a photo. What is her approximate value? She is in excellent shape. It is not worth more than about 30.00 dollars. I have a Collectible Memories Reesa doll still in the box and am hoping to find out what it is worth. Please? These dolls were mass-produced. I have seen them on eBay for less than $20. My doll is in its package. 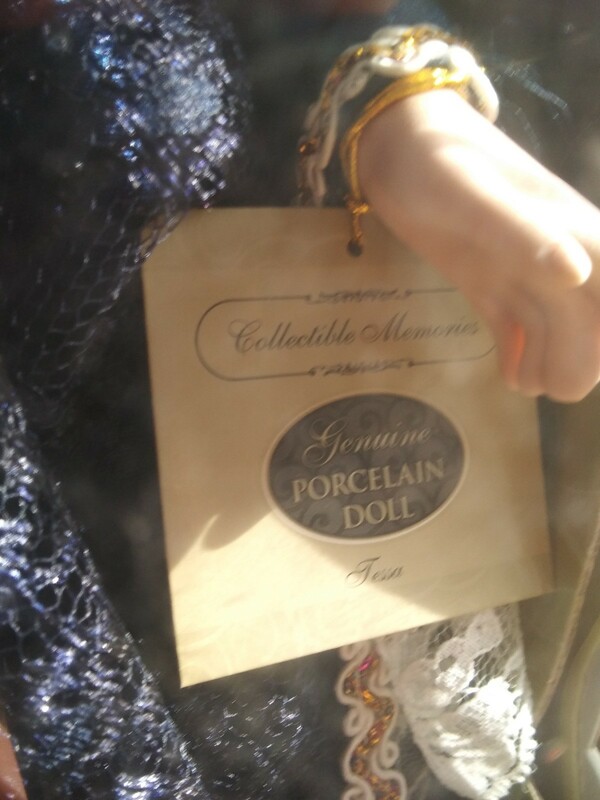 It is a limited edition Collectible Memories, genuine porcelain doll. I don't know what year or anything about it. How do I find out? These dolls are mass-produced. They have very little monetary value, but are pretty. They usually come with a certificate that tells you what number in the series is was. The doll should also have the markings on the neck, back or foot. 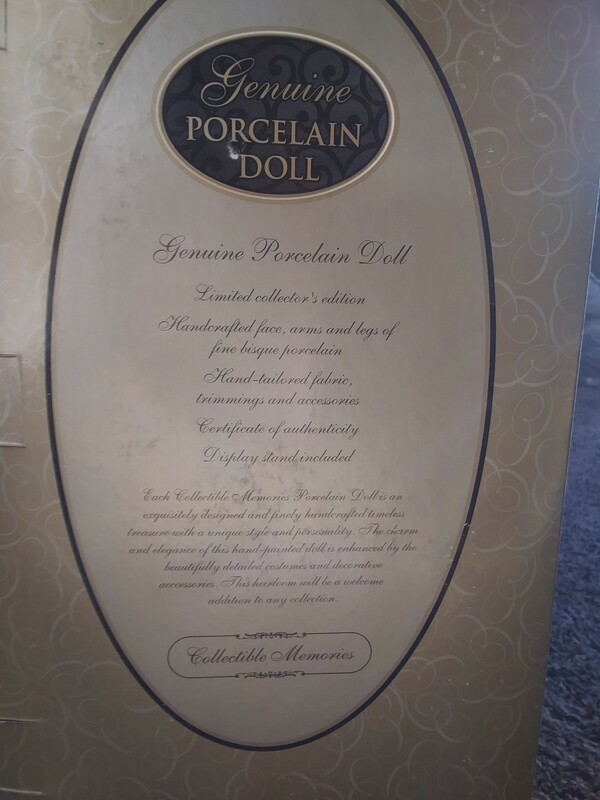 What is the value of a Collectible Memories genuine porcelain doll, limited collector's edition 29 inches tall. She has a handcrafted face, arms, and legs of fine bisque porcelain. The clothing is hand tailored fabric, trimming, and accessories. I have the certificate of authenticity. The display stand is included. I have 3 dolls: Jennifer, Anne Shirley, and Allison. EBay has them for Bid/Sale up to about $30.00. Some offered online selling for $10-$25. Keep in mind that just because the doll may be fancy, old, inherited, etc., it most probably has little value as most are mass produced. You can do your own research on eBay, Google etc. There are a lot of dolls available now. I found her in a plastic airtight box filled with newspaper. 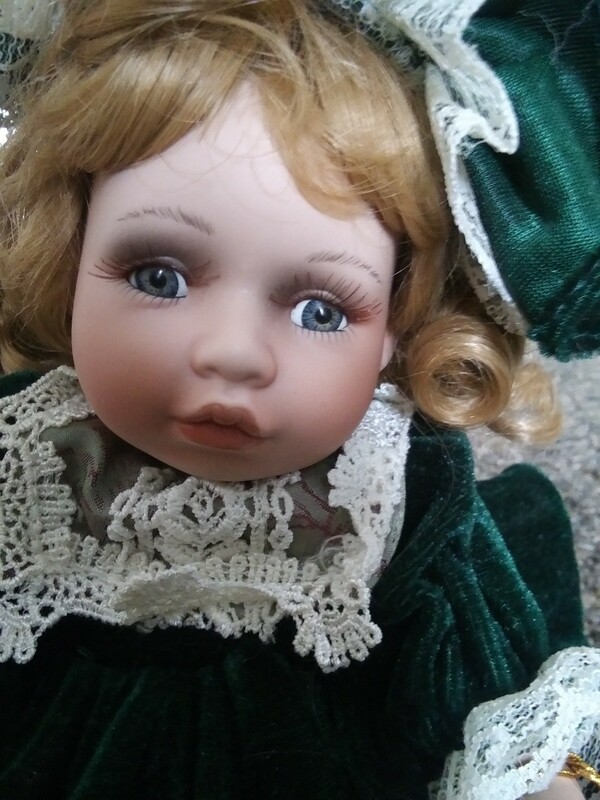 She's in perfect condition, and has a tag on her wrist that reads "Collectible Memories: Porcelain Dolls: Taylor". Hi - you may find some info on eBay, Google, etsy or Replacements.com. 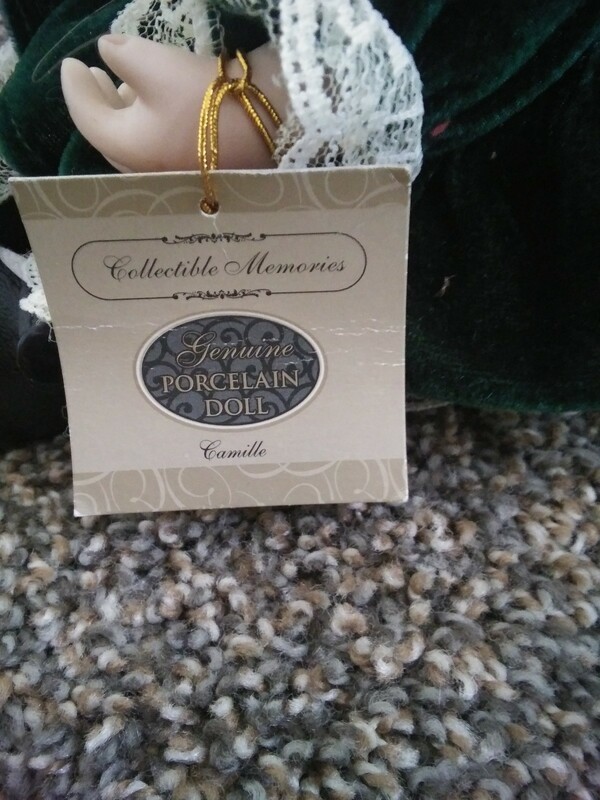 Can anybody tell me any information on the Collectible Memories genuine porcelain doll, Samuel? From the packaging and the box, the doll is stored in this is a doll that is mass produced. The doll more than likely sold for $50 to $80 depending on where it was purchased. Unfortunately, mass-produced dolls like this don't have a high resale value and most people end up selling them for $10 or just giving them away. It is very hard to actually sell one. Quite the dapper little guy! They were sold at many retail outlets like larger Hallmark stores, and stores that specialized in home decor, the occasional toy and department store. He had a sailor girl "sister" named Kenzie. She was sweet also! You sometimes see them being sold together. Some of the Collectible Memories brand dolls are still valued (meaning selling on eBay) for around what they cost in the 1990s-early 2000 (in the $20-30 range). If he were mine, and I had space, I would put him on a shelf and enjoy him. Keep him in nice shape and maybe in another 10-15 years he may increase in value--of course that is never a guarantee. 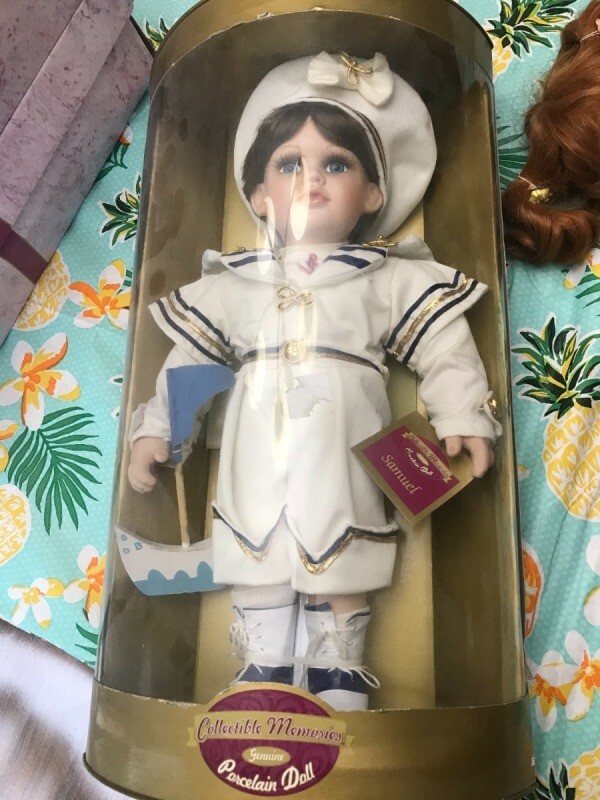 Why I think there is a possibility is today people are dumping dolls like crazy to get back closets and shelf space and there is going to be a contingent of those folks in 15 years who are going to feel nostalgic for their past and may go looking for him. Then supply will be low, demand may be higher and his value may increase! Do a search on "Google" put in all the info. you have. Also check on eBay to see if any dolls like yours are offered for sale, and check Craigslist. Collectible Memories dolls are mass produced and sold to stores like K-Mart and generally sell/sold in the $39.95 field and, sadly, most of these dolls have very low value and are not really a "collectible" item as they are very plentiful in all sizes, models and mostly new condition. Boy dolls are not as plentiful as girls so occasionally they might sell a little faster but may not sell for very much money. There are about 650 Collectible Memories porcelain dolls presently listed for sale on eBay (the world's largest doll selling site) and it is estimated that only 3-10 of these dolls will sell each day. There are usually over 1,000,000 dolls listed for sale over any given time period which just means that most of the dolls will never sell - at any price. 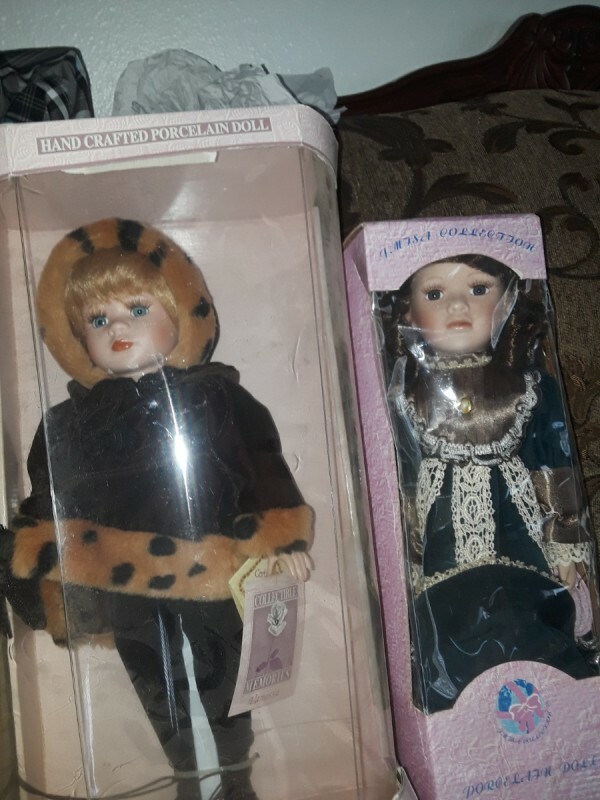 Take a look at Collectible Memories dolls listed on eBay and you will see all sorts and the prices are up and down - just remember, any listing that states "free shipping" will be a minus $8-$10 off the selling price as the seller has to pay for shipping out of that money. Now if you look at the dolls that actually sold over the past several months (and what they sold for - shown in green) you will see that most were "given away" or should have been considering how much trouble the seller went to sell for $3-$5. These were very popular when I used to work in retail, but sadly did not hold their value. If he were mine, I would put him back on a shelf and keep him nice and maybe in 10-15 years after everyone is done purging their doll collections he will have a nostalgic craze and people will want to buy him again! Sorry not to have better news for you! I can't seem to find the value of my sister's porcelain doll. On the box it says Memories Classic Collection. I've looked everywhere and I can't find the doll not even on eBay. She wants to know what it's worth. 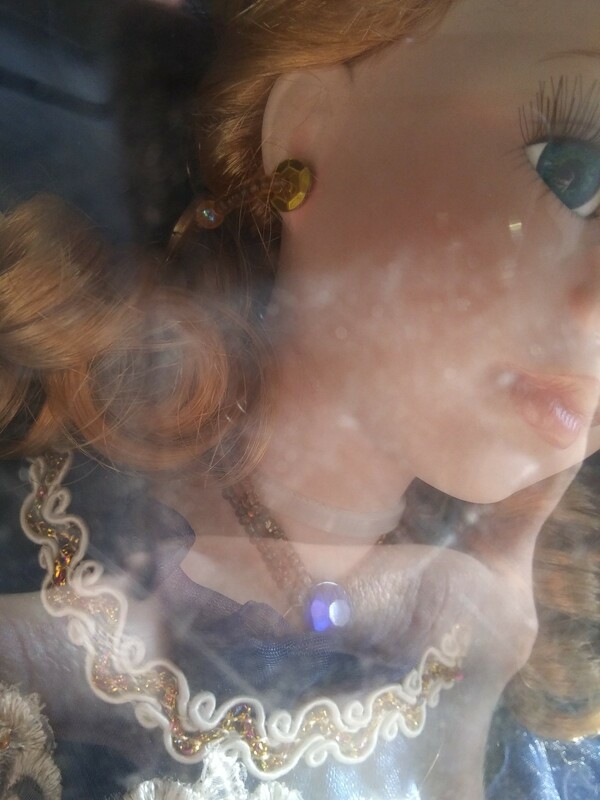 I am trying to find the value of a Collectible Memories club, musical collection, genuine porcelain doll, Camille. 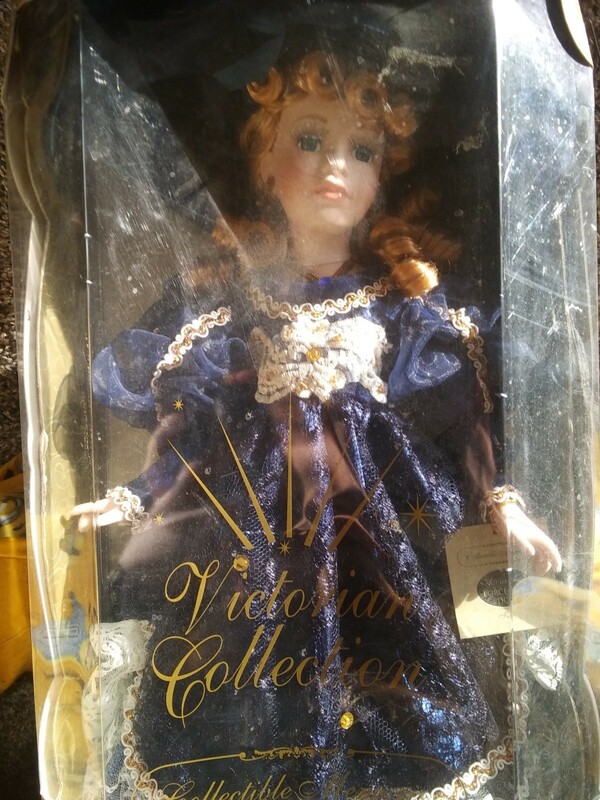 I have a Collectible Memory Doll, Vanessa, still in the box. Does anybody know about how much it is worth? 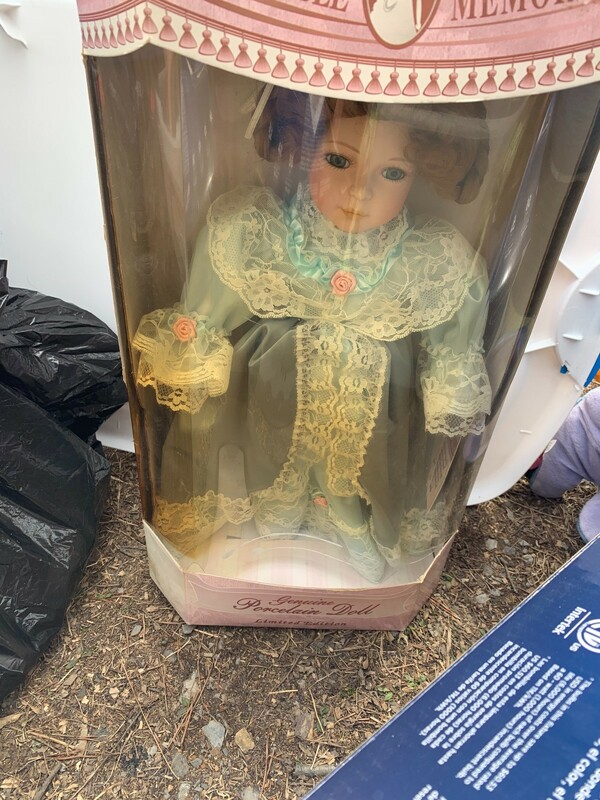 I have a Collectible Memories porcelain doll still in the box. I have been told it has never been opened. It does have a rip in the bottom of the box as you can see in the picture. I'm wondering how much this will cost if I were to sell it. Right now there are no completed/SOLD auctions on eBay that match her, so it is hard to give her exact current market value. I only use SOLD auctions and look for exact matches to give value...as there are often similar items where one has value and one doesn't. The way I research condition does matter...so one with a perfect box may fetch a small amount higher than one with an imperfect box--I would judge value on the exact match. That said, there are a large number of unsold similar dolls in a variety of price ranges from the low (5.00 up to the mid 20.00), which points to the sad glut of dolls out on the market at the moment. Unfortunately for collectors, eBay and Etsy have kind of killed the "value" on these as they used to be rare and now are almost literally a dime a dozen. The way the market runs, since there is a glut TODAY and many people are purging them now to get space back, eventually they may become more scarce and therefore more sought after and have their value grow. You never know with the market! Stranger things have happened!! 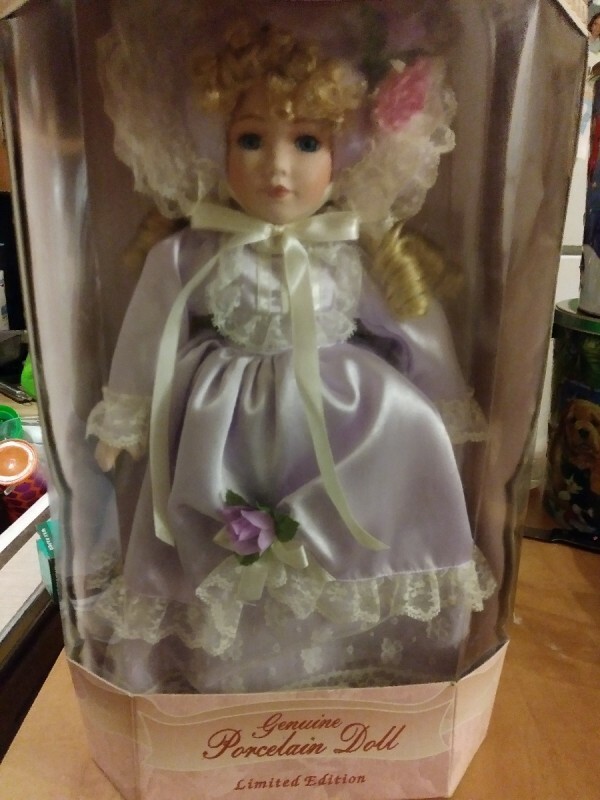 This doll is still in the box, 6" tall. Her name is Tessa and she is from the Victorian Collection. I have a genuine porcelain limited editionAbigail doll. This was found in storage with my grandmother's stuff. I can't find this exact doll anywhere can anyone help? I know there are some on eBay for $30ish, but I figured I would check anyways. 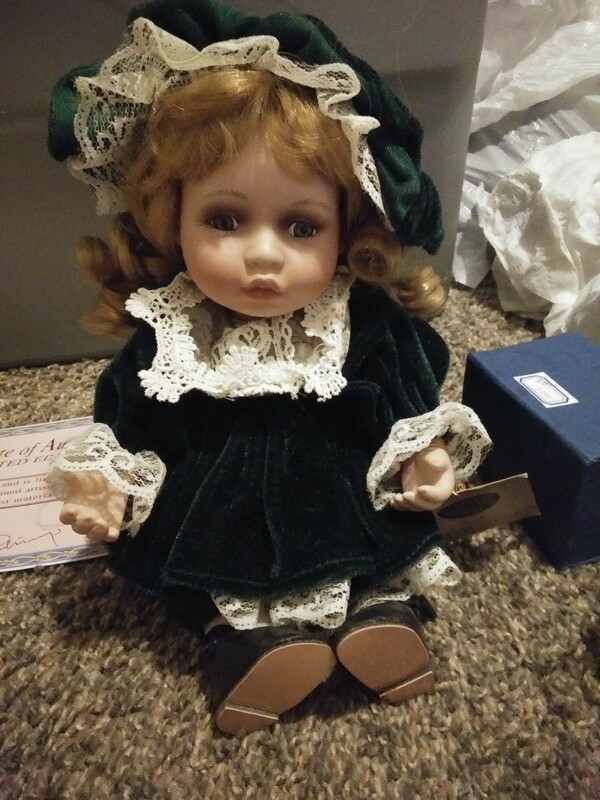 I got this doll from my great grandma. I can't find any information on Karen. Is she rare? Any info would be great. She is still in the original box with the Kmart tag still on the bottom. 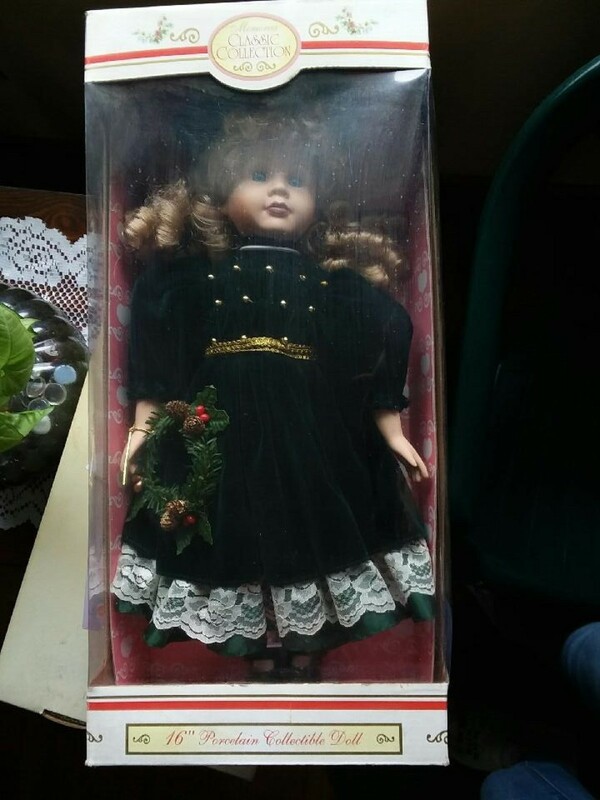 I have an 8" sitting doll in a green dress. She plays music and moves in a circle.